We’d love your help. 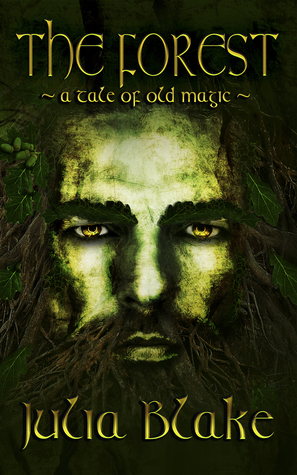 Let us know what’s wrong with this preview of The Forest ~ a tale of old magic ~ by Julia Blake. This time Sally, Jack and Reuben have been selected, and it’s their turn to be tormented by long-buried jealousies aroused by the dark entity existing within its shadowy glades. Only by confronting the Forest’s secrets, can they hope to break the curse and change their destinies - if they have the courage. To ask other readers questions about The Forest ~ a tale of old magic ~, please sign up. While I found enjoyment from books at an early age, my love for literature was cultivated in college, specifically through works from the 14th, 15th and 16th centuries. There was something in the way those writers and poets spun their tales, the care they took with each line, the beauty of their styles that called to me. When I first started reading The Forest, I immediately felt at home within its pages. I was sucked in from page one and felt, instead of reading a newly released novel, I was reading something from long ago just recently discovered. More than once, I found myself stopping and re-reading a line. Not because I didn’t understand it, but just to admire how beautifully it was written. And yet, as I moved further into the book, it still flowed like a modern novel. As a matter-of-fact, for most of the novel, I wasn’t really sure what time period it took place in. Sometimes it felt like modern times. Other times it felt like days of old. And to me, that is the magic of the book. The characters were written in a way that made you care about them, root for them, your heart soar and your heart break. You wanted to keep turning the pages. Wanted to know what happens next. Blake’s descriptions were such that you could see in your mind the world she’d built, but not written in a way you were distracted from the story. I would love to discuss more in-depth but I don’t want to give anything away. If there really is some imaginary line a work must cross to be considered literature, Blake’s The Forest has come the closest to that line of any book I’ve read in recent years. It is definitely one that will have a permanent place on my bookshelf and be revisited in the future. Julia Blake creates suspense by keeping the reader guessing as she weaves her fantasy about a forest full of magic. There is a curse placed on this forest. As any insightful reader knows, only good can break this curse. But can they break it? That is the suspense. The author writes both fiction and poetry in this book and succeeds with both. Her prose, itself, is poetic. Her characterizations are well rounded. The forest is well described, in fact, it is a living entity. Of all my books, this is perhaps the one I care the most about. Conceived thirteen years ago after a germ of an idea sprouted upon overhearing the most wonderfully quirky name ever at a family party, it quickly grew into the rich, complex and darkly delicious tale of old magic, curses and betrayed love that it is today. Upon completion, I gave it to friends to read and received such negative feedback and bleated complaints that it wasn’t like any of my other books, that it languished in a cupboard and on an old memory stick, almost completely forgotten about. Years went by, twelve of them to be precise, and The Forest barely intruded on my thoughts at all, until I became a published author and began polishing up my five other novels ready for release, yet still, I hesitated over The Forest – those long-ago criticisms ringing in my ears. Eventually, another friend, not one of the original readers, begged me to exhume it and I reluctantly agreed, lending it to her and another well-read friend. To my surprise, they both loved it and were insistent that The Forest needed to see the light of day. So, I gave it a thorough edit and sent it off to betas. I received mixed feedback from them as well, but it was encouraging enough for me to take on board their suggestions and send it to ARC readers, handpicked to enjoy this genre and style of book. To my delight, the feedback this time was almost a unanimous vote of approval and a general consensus that this book needed to be released into the big, wide world for others to read and enjoy. And so, here it is, all 129,500 words of it. Yes, it is a big book – and that’s after trimming almost 10,000 words from it – but I’ve been assured it’s an engrossing and fast-paced read. Written in a traditional style, it’s more Frankenstein than Harry Potter, The Forest tells the tale of a mystical, powerful forest lost somewhere in a forgotten corner of Britain. A place steeped in tradition and folklore, none can penetrate beyond its outer reaches except the Lords of the village and the forester and his offspring, yet it’s rumoured others live within its shady glades and shadowy glens. It is a taker of men, this Forest, and if the old legends are to be believed, doesn’t always return those it takes. A village lies on the edge of the Forest. Lonely and isolated, its inhabitants never seem to leave and life there is insular and peaceful. But every generation or so, the White Hind of myth is seen within the Forest and in her wake trails suspicion and death, with three village youngsters becoming victims of a triangle of murder and suicide. It is the way it has always been, until this time. This time something is different, and Sally, Reuben and Jack have a chance, a real chance, of breaking the curse and its tragic consequences. But to do that they have to be prepared to seek out the secrets of the Forest, to confront the long ago past to understand the origin of the curse, only then do they stand of chance of breaking free. It’s powerful, dark stuff and although I hesitate to call it fantasy I suppose for want of a better label, that is what it is. However, don’t read it expecting elves and goblins, or trips to other worlds, for you’ll be disappointed. It is a tale of old magic, of natural forces that existed long before man and will still be here long after we’ve gone. It is folklore and legend, tales whispered around the fire at night and passed down from generation to generation. The story centers on a rural village called Wykenwode, perched at the edge of an ancient and mysterious forest, which is guarded by an unseen barrier that only a predestined few can pass beyond. Those who can enter the heart of the f The Forest is the kind of story you’d expect to find in a dusty old tome if you wandered into a magical bookshop in an old English village. It’s a timeless epic tale full of mystery, love, magic, folklore, and the complex interweaving of human hearts across the eras. I've had a couple days to sit after finishing this book to try and collect my thoughts and still I wish I had the words to capture my feelings. I truly appreciated the depth and history Julia added to this book. The village is full of history and legends about the Forest bordering them. It makes the reader feel as if they are visiting a real place. Meeting Rueben, Sally and Jack, we get to grow alongside them and see the darkness that is a subtle part of life in Wyckenwode. I enjoyed the magic a I've had a couple days to sit after finishing this book to try and collect my thoughts and still I wish I had the words to capture my feelings. I truly appreciated the depth and history Julia added to this book. The village is full of history and legends about the Forest bordering them. It makes the reader feel as if they are visiting a real place. Meeting Rueben, Sally and Jack, we get to grow alongside them and see the darkness that is a subtle part of life in Wyckenwode. I enjoyed the magic and atmosphere of this story. Blake has a way of making the characters come alive. I laughed and cried and the ending, well, I won't spoil it but she gave me the ending I didn't even realize I wanted. ‘The Forest’ is many things - a romance, a coming of age story, a collection of folklore tales and a supernatural thriller. Impressively it manages to wrap all those elements together into a whole that is satisfying and rich, without one element ever dominating. It’s also pleasantly different from a lot of modern horror fiction. If I were to compare it to anything it would be Phil Rickman’s work. Julia Blake’s book has a similar mix of the occult and a kind of pastoral fantasy, as well as an evident love of the British countryside. I’m also happy to report that it’s just as good as Rickman, in other words very good indeed. It’s set in a single place, the weird village of Wyckenwode, but across multiple points in time. The story crosses centuries and generations, the result being a wonderful picture of rural English village life. Of course it’s not just that, it’s also an effective, complex story filled with magic and mystery. It focuses on three young friends who live in the village- Jack, Reuben and Sally. There’s an inevitable love triangle, and the relationship between the three works well. Around the trio, Blake creates a believable cast of characters to populate the village and Wickenwode really comes to life on the page. Despite its weirdness, it’s a very real feeling place full of gossip, jealousy, joy and sadness. The forest that sits beside the village is a character in its own right. Folklore about the area abounds in the village and these tales are relayed in detail in the book. The story begins with the sighting of a mysterious white deer of legend which the villagers believe will bring disaster and misery with it. As the book progresses it becomes clear that the supernatural events of folklore are still ongoing and the three friends are their focus. The story jumps around a lot as the tension mounts, with events taking place in the present, as well as the immediate and distant past. The effect is fairy tale like at times and reminded me a little of Angela Carter’s retellings of folk tales. There is a strong plot running through the book though, and apparently unconnected events gradually come together into a satisfying conclusion. Throughout it is infused with magic and a timeless, dreamlike quality that’s hard to pull off but Blake does well. The book is scary, moving, amusing and covers universal themes - love, friendship, parenthood and family. All that makes for a rich and satisfying read. Blake’s prose is elaborate and at times has an old-fashioned ring to it that suits the timeless feel. I’m becoming increasingly used to punchy prose with short sentences and novels with chapters only a few pages long. ‘The Forest’ has neither, sentences can run over three or four lines and chapters tend to be long. That’s not a criticism, because Blake writes well and the book is readable and gripping. Be aware going into it, though, that this is a book that demands and rewards its readers investing time and attention in it. It’s clever and intricate and at times that meant my brain failed to keep up with it when I tried to read it in short bursts. For readers who are after something a little different, I’d heartily recommend this beguiling and entertaining book. It’s not always an easy read in the way so many modern books are, but it is a very rewarding one. This is one hell of a story. Crafted marvellously, it comes from an imagination that knows no boundaries. It's rich, dark, enticing like the forest it presents us. It's lush with magic and wonder, the characters singing out of the pages until you can't stop humming to their tune. It takes you away on a journey you need to follow through, as if the pages are the very path deeper into those woods. It's been one of my favourite reads this year, and having read the author's previous work, I c Blimey. The author’s storytelling prowess and larger-than-life characters lead the reader to the lush forest’s edge in the insular farming village of Wykenwode—and through its barrier, to witness the fallout from a curse that transcends time. A curse the vile entity trapped inside the forest feeds on, siphoning a vengeful evil by feeding on and manipulating the inherent darkness steeped in its targeted villagers. There’s no shortage of hatred, jealousy, envy, greed, pain, anger, and betray So Mote It Be! A curse the vile entity trapped inside the forest feeds on, siphoning a vengeful evil by feeding on and manipulating the inherent darkness steeped in its targeted villagers. There’s no shortage of hatred, jealousy, envy, greed, pain, anger, and betrayal for the entity to thrive. Until, the forces of good can effectively break the curse. The boundary line between past and present is blurred through parallel lives, whereby Sally, Reuben, and Jack are destined to fall victim to the accursed fate suffered by their counterparts. An enthralled reader, I willingly somersaulted from one generation to the next as events unfolded through the author’s use of language, a rich compost of bewitching and evocative descriptions. The Forest, full of secrets, love and reoccurring sacrifice. Will Sally, Jack and Reuben end the Curse? Julia creatively describes each of their lives, entrancing us to their world. Her writing exquisite, a literary delight as she weaves the magic of the forest around and amidst the characters lives. I thoroughly enjoyed it and always love her work. Julia delves deep into her writing. I highly recommend her books. A story filled with secrets, curses, old rituals and traditions, (and an inauspicious white hart), the Forest is a dark and magical tale, all tangled together in the dark misty depths of an eldrich woodland. I'm a fan of folklore, and it runs like a vein of silver through the coal-dark mysteries of this tale, glimmering here and there amongst the various story-threads like moonlight through bare branches. There are several such threads running through the narrative, weaving away and pulling you on A story filled with secrets, curses, old rituals and traditions, (and an inauspicious white hart), the Forest is a dark and magical tale, all tangled together in the dark misty depths of an eldrich woodland. There are several such threads running through the narrative, weaving away and pulling you onward as you read, and none of them are straight and clear roads through the trees. Instead they're all delightfully tangled paths, each leading you deeper into the sylvan darkness. I've read other novels by Ms. Blake before and liked them. This novel is no exception. Although it's a slightly longer read than I'm used to, it doesn't lag. That's a plus. Okay, we have a forest. It's full of magic. There are strange creatures, journeys of the mind and heart, friendship, mystery, and awe. We also have a town full of oddball characters, and I love me some offbeat characters! That's really the strength of this novel, the sharp characterizations as well as the seamless way in whic I've read other novels by Ms. Blake before and liked them. This novel is no exception. Although it's a slightly longer read than I'm used to, it doesn't lag. That's a plus. Okay, we have a forest. It's full of magic. There are strange creatures, journeys of the mind and heart, friendship, mystery, and awe. We also have a town full of oddball characters, and I love me some offbeat characters! That's really the strength of this novel, the sharp characterizations as well as the seamless way in which it's written. If y'all want to read a good story--outside of mine, that is ;) --get this novel and get it today. I love tales of ancient folklore, myths and legends. So, I was greatly anticipating reading and enjoying this book…and I was not disappointed. From the very beginning The Forest lured me into its dark depths. As Sally, Jack and Reuben find their destinies entwined and linked to past and present events, I wondered at times if it was set in modern days. However, that wasn’t confusing. If anything, it added to the feeling of the timelessness of the forest, with its old magic and dark tales of curses. The story is beautifully written, with lyrical prose that immersed me in the scenes. The characters are well-rounded and easily found their way into my heart. I think this is the best book by Julia Blake that I’ve read so far, and that’s saying a lot when her other books are great, too. This book is so beautifully written about friendships that grow and last forever. It has the complexity of love, jealousy and pain. It is much deeper and complex with the power of history unknown and lost. What seems so simple is complex and faces those from before as well as today. This book will stay with me and addresses some of my beliefs. The Forest is a dangerous place. Long ago, a woman foretold of something coming and she had not lied. Periodically, when the white hind is spotted, someone goes missing. Someone dies. In the town of Wyckenwode, there appears to be a curse and three individuals have been chosen. Sally, one of the kindest girls in town; Jack, one born of a wicked temperament and Reuben, a troubled young man. Can they uncover secrets, discover truths, and maybe save themselves? As complimented previously, the charac The Forest is a dangerous place. Long ago, a woman foretold of something coming and she had not lied. Periodically, when the white hind is spotted, someone goes missing. Someone dies. In the town of Wyckenwode, there appears to be a curse and three individuals have been chosen. Sally, one of the kindest girls in town; Jack, one born of a wicked temperament and Reuben, a troubled young man. Can they uncover secrets, discover truths, and maybe save themselves? As complimented previously, the characters are written in a way, you develop a caring for them as you would a regular person. Though I felt it began a bit slow, I understood Blake felt you needed to know everything there was to the characters. You're introduced to them, then spoon-feed as you would a true friendship, until you actually know them. You're also receive the town’s history- even history before the town! It’s depths knew no bounds, which is why the pace, structure and ending came about so beautifully. This isn't my first book by Blake, so when I say this one is unlike any of her previous tales, it's the truth. The Forest ~A Tale of Old Magic~ is one that will keep you turning the pages, until they are no more. Grab a copy. Cheers! This was a magical tale where past and present intersect. The story is full of magic, suspense, love, and friendship. The story was elegantly written with just the right amount of description to take the reader on the adventure in this village next to the forest. We follow Sally, Jack, and Reuben from childhood through their early adult years in a village of close knit families and friends. A curse grips this town about every generation, to plague the village with death. The story unfolds from p This was a magical tale where past and present intersect. The story is full of magic, suspense, love, and friendship. The story was elegantly written with just the right amount of description to take the reader on the adventure in this village next to the forest. We follow Sally, Jack, and Reuben from childhood through their early adult years in a village of close knit families and friends. A curse grips this town about every generation, to plague the village with death. The story unfolds from past to present seamlessly. Are Sally, Jack and Rueben tied to the curse? How could this be? Can they avoid it? Not only do you follow the three main characters, but are also introduced to several supporting characters in the village. This was the amazing thing Julia did, she gave life to so many characters. Each was described wonderfully without drowning the story or the main characters. Intertwined in the story are village "fairy tales" passed down through the generations. These tales passed down by word of mouth give clues about the curse and how it began. But what is true and what has been embellished? During the telling of these tales, I felt like a child getting lost in the wonderment. The curse is wrapped around some of the seven deadly sins. Envy is the centered sin, with greed, lust, wrath and pride playing their part as the ENVY grows. A FANTASTIC 🌟🌟🌟🌟🌟 star read!! I really encourage you to get los in The Forest! Not a bad book. Clearly Julia can write well and tell a good story. The village of Wyckenwode is well realised and the characters are unique and identifiable. The premise was intriguing and the theme of jealousy was an engaging one. However, especially in the beginning and middle of the book I encountered a lot of redundant adverbs and adjectives such as "confused bewilderment", and "wondered curiously". Particularly in book two, it seemed that every noun required at least one adjective, and ever Not a bad book. Clearly Julia can write well and tell a good story. The village of Wyckenwode is well realised and the characters are unique and identifiable. The premise was intriguing and the theme of jealousy was an engaging one. However, especially in the beginning and middle of the book I encountered a lot of redundant adverbs and adjectives such as "confused bewilderment", and "wondered curiously". Particularly in book two, it seemed that every noun required at least one adjective, and every verb an adverb, to the point that it would pull me out of the story, which was a shame in such a well realised world. What would you do if your town had been cursed for generations? If you had to live in the middle of a dark forest with a mysterious entity and a secret behind every door? This is the world of The Forest which successfully mixes old world English charm with modern day heartache. Think hunting and witches, love stories and fairytales, Lords and loss. Without wanting to give to much away, this book really has something for everyone. Julia has a wonderful gift for description that, in parts, reads al What would you do if your town had been cursed for generations? If you had to live in the middle of a dark forest with a mysterious entity and a secret behind every door? Wyckenwode, Wyckenwode. Defender of the innocent; Protector of the good. I really enjoyed this story; ancient wisdom carefully interwoven with a new and enchanting tale. The beginning is quite slow, but it really picks up from the halfway point. The paths of the past, present, and even the future cross as destiny unfolds. A battle of darkness vs. light brews in the murk of The Forest which surrounds the seemingly tranquil village. Intriguing, well-developed characters that I cared about. The fir Wyckenwode, Wyckenwode. Defender of the innocent; Protector of the good. The first chapter is written in a different tone from the rest of the book btw. Wonderfully creative and engaging story! It took me a while to get into it, but to be fair, there was a lot of back story to be told. I fell in love with the characters and although I felt like I knew where the story was going, the author continued to surprise me. This is the type of story you want to read again and again. With a bit more editing to weed out some of the 'telling', this could become an epic classic, read by young and old for generations to come. Julia Blake outdid herself with this novel. It is full of secrets, suspense, danger, love and friendship. Surrounded by the town of Wykenwode, the Forest holds many secrets. A curse from long ago continues to bring pain and misery. Can this curse be broken? Not wanting to give anything away I can only say this is a wonderful written work that will take you on a magical journey you don’t want to miss. I was born and raised in the beautiful historic market town of Bury St Edmunds in Suffolk, where I live still with my daughter, one crazy cat and a succession of even crazier lodgers. Although The Book of Eve is my first published novel, I have been writing stories and poems since I could first pick up a pen, and I promise there are many more books in the pipeline. I write the kind of books that I I was born and raised in the beautiful historic market town of Bury St Edmunds in Suffolk, where I live still with my daughter, one crazy cat and a succession of even crazier lodgers. Although The Book of Eve is my first published novel, I have been writing stories and poems since I could first pick up a pen, and I promise there are many more books in the pipeline. I write the kind of books that I like to read myself. Books I can escape into and that make me laugh, cry and really connect with the characters. I also like my books to have a very satisfying ending, where all is explained and no string is left untied, well, not unless I'm planning a sequel that is.